The Stephen F. Austin State University Bachelor of Science in interior design program has been awarded the Council for Interior Design Accreditation. The program has maintained accreditation since 1985, and the reaccreditation is effective for six years. Pictured, from left, are interior design faculty members Mitzi Perritt, professor, and associate professors Leisha Bridwell and Sally Ann Swearingen. NACOGDOCHES, Texas - The Stephen F. Austin State University Bachelor of Science in interior design program has been awarded the Council for Interior Design Accreditation. With this accreditation, which attests to program quality, interior design students can be confident the program meets the rigor of peer review and will help them develop skills and knowledge required to practice interior design, according to the CIDA accreditation letter. CIDA representatives visited the university in September 2017 to conduct a program review and assessment. The program has maintained accreditation since 1985, and the reaccreditation is effective for six years. 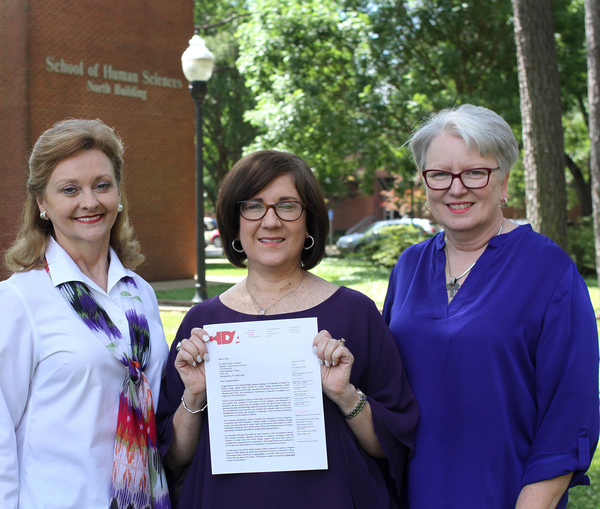 "By having an accredited program, we are ensuring our students and the design community that SFA students come from an interior design program of the highest quality," said Dr. Lynda Martin, director of the SFA School of Human Sciences. SFA's interior design program offers students an opportunity to learn to design and plan various commercial and residential areas while also preparing students to pass the National Council for Interior Design Qualification exam. Students learn a plethora of design techniques by enrolling in specialized courses, such as interior materials and cabinetry, interior lighting, codes, computer visualization, and 3-D design. Senior-level courses provide students opportunities to work on real-world projects. Past projects include helping plan a volunteer fire station in Douglass, creating designs for a bathing and laundry facility for the homeless, and rendering renovation plans for a historic Nacogdoches building. The university also launched a partnership with Houston Community College in 2017. This partnership offers Houston-area students pursuing a bachelor's degree in interior design the opportunity to complete their SFA degree without leaving Houston by taking courses online and at the HCC Central Campus. For more than 35 years, CIDA has been "passionately committed to the ongoing enrichment of the interior design profession through identifying, developing and promoting quality standards for the education of entry-level interior designers, and then encouraging, accrediting and supporting educational programs to aspire to those standards," according to the CIDA website. To learn more about SFA's interior design program, visit sfasu.edu/hms.